Airtel night and weekend plans have been repackaged to meet the needs of young and trendy in the society. Students and residents in major higher institution campuses across Nigeria as well as those who need freebies like best rates on data, night browsing for your favorite movies, series, music, and special weekend deals, will find the Airtel time/weekend plans interesting. The smartTRYBE plan as always encapsulates the Airtel night and weekend bundles. But things have been changed a little and it appears Airtel night and weekend plans appear to be one of the cheapest in the country at the moment. Where Glo and Etisalat offer you just 1GB for ₦200, Airtel offers you 50% more! – 1.5GB. First off, you must be subscribed to Airtel SmartTrybe Tariff plan. Getting in is pretty easy, just dial *312#. Before now, the price of 1.5GB Trybe night plan was ₦50, but e be like say recession reach their side, they bumped the price to ₦200, weekend plans inclusive. 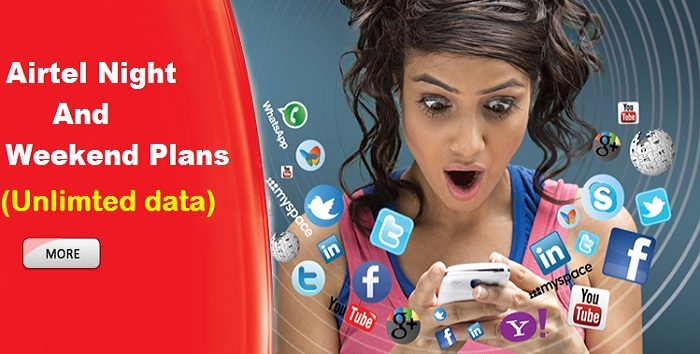 Now how do you subscribe to SmartTrybe 2.0 to enjoy the Airtel night or weekend plans? Did I tell you that the Trybe plan also gives you 1GB for ₦500? It sure does! After migrating to SmartTrybe, you’d have the option of Trybe Night Browsing which accommodates the Airtel night plans. On selecting the option (option 3), a new page comes up with either 500MB for ₦25 (MTN has a similar plan) or 1.5GB for ₦200. All you need to do is select the plan which is most convenient for you. This plan is only usable between 12 am and 5 am – the time normal humans use for sleeping. So, for those fortunate/unfortunate humans like who scavenge then internet at night (like me) who gets the bulk of our work done online, this is for you. Also, we both know that internet speeds are always maximum during off-peak periods (at night and weekends). So let’s assume your connection speed downloads at the rate of 300KB/s (which is even slow for nights), in 3 hours you would have downloaded/used-up 3GB data – do the math. Assume you are staying in an area with off-peak speeds of say 0.5MB/s, you would be bagging over 1.5GB for every hour used during that time. Airtel weekend plans have evolved over the years. Sometime in April last year, they introduced a weekend plan of 1GB for ₦100. This was later repackaged as 7GB for ₦700 – not that there was much difference anyways. Today, Airtel has yet repackaged it and this time, it is offering 250MB for ₦200 plus and extra 30minutes unlimited free. It should be noted that if you subscribe on Friday, it expires on Sunday, and if you subscribe to Airtel weekend plan on Sunday, your plan won’t expire 11:59 pm same Sunday. As for timing, the plan will Start working from Saturday 12:00 am and it will stop/pending work on Sunday 11:59 pm.